How is your CNY and happy working for those resuming with work! I noticed recently my trial products are of Asian brand. But my more permanent skin care are not. Anyways, I am now starting to switch one by one of the items to K-beauty product and will try my best to stick to it for this 2 months straight! Since 2010, Gobdigoun started the business in Korea. The products are now selling in Myeong-Dong, Seoul, South Korea, in LG Brand Skin Care Product Store. Among the products of Gobdigoun: 24K Golden Cream of Placenta Power and Placenta Cellulose Gel Mask, are the best selling productsbin China, Taiwan and Japan's market. You may visit their Facebook English page, or their official site, HERE. If you have been following my Instagram (@beeleec) or Facebook, you'd know that I have some sensitive reaction thus I cannot try any products that touches my face. Luckily it has soothed much more. 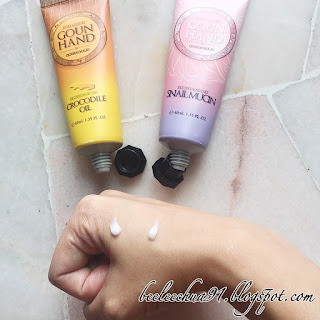 So at that moment, the only non-face product that I could try are the hand creams. I like the packaging. Convenient. No leakage. Brightly lit. Makes me feel happy. And definitely a pro for the forever washing and cleaning up before, during and after CNY!!!! Don't just pamper your face. Pamper your hands too!!! They are just greasy or too strong a scent. More of a temporary relief for my dry skin. I am looking for a more lasting relief for my dry dry skin. 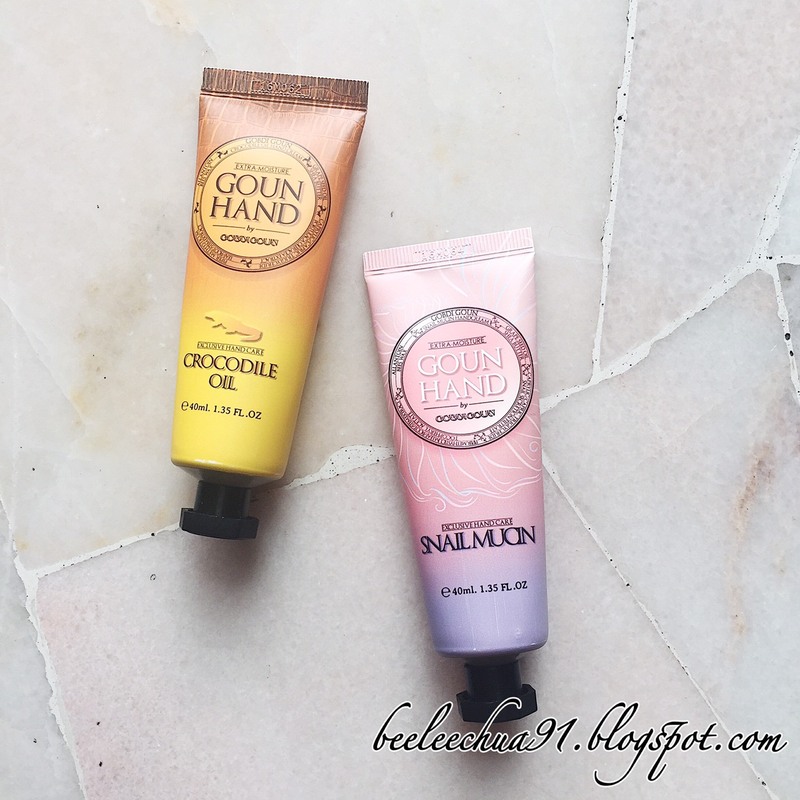 My favorite Hand Cream by far goes to Gobdigoun's Goun Hand Cream. 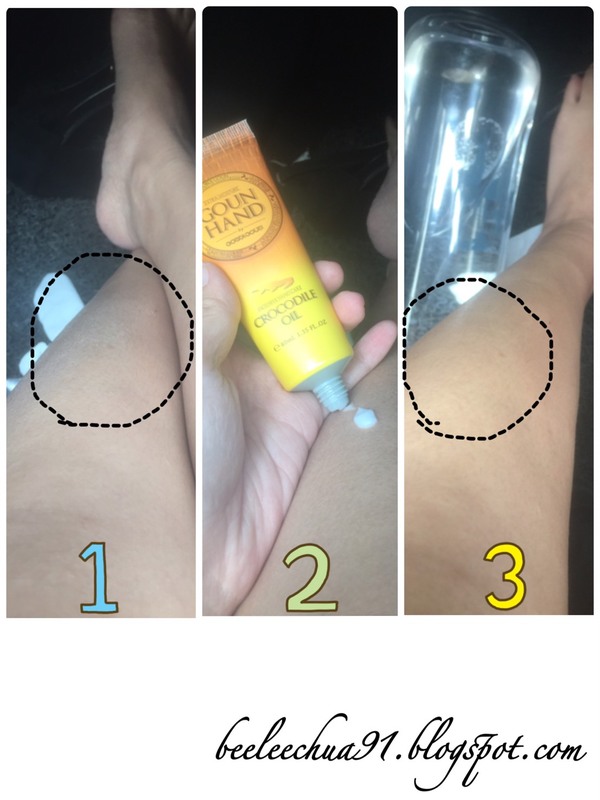 Foot cream goes to L'occitane (full review here). In image 1: Circled area is the white patchy skin, if you can see. Glad this works temporarily to save me the embarassment. That is why I rarely wear skirt or shorts when going for events. If I do, I will need to spray some water mist (domt really work) or lotion first! In image 3: No more dry skin! Yes, I cannot even write anythimg and feels much more confident in my own skin. Love this lightly scented and non-greasy lotion ! Will need to purchase it when I run out of it. Where can I purchase this in the US?